Some harbors make it easy for boaters to get onto the water, others still searching for options. SOUTHERN CALIFORNIA — Owning a boat doesn’t necessarily mean you’re always on the water, especially for those who have their vessels on a trailer instead of a boat slip or marina. Here in Southern California there are certainly a few harbors catering to boaters who bring their vessels to the water via trailer. Yet there are other venues where transferring a boat from land to water is so challenging it might not be worth the time and effort. Boat launch ramps are a vital lifeline for boaters, providing public access to the water for anyone who wants to take in a sail or enjoy local waterways on any other form of personal watercraft. Of course public access to public waterways is guaranteed under California law. Therefore it follows the lack of boat launch ramp facilities – or ones where uses are effectively limited – harms or interferes with a boater’s right to access public waterways. Long Beach might just be the friendliest city in Southern California when it comes to the number of boat launch ramps available to boaters. There are five public boat launch ramps spread out across the city’s waterfront. Marina del Rey has a large, unstaffed public boat launch ramp at 13477 Fiji Way. The ramp is located on the harbor’s eastern edge and, despite heavy vehicular traffic in the area, is relatively easy to access from Lincoln Boulevard (Highway 1) or the 90 Freeway – both major highways serving the Marina del Rey area. 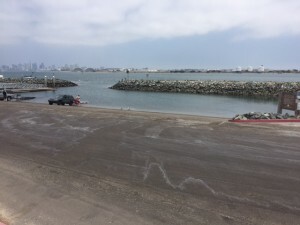 A boat launch ramp in Ventura re-opened in June 2014 after the port district there upgraded the older facility. Ventura Harbor’s original boat launch ramp opened in 1963. The new launch ramp was expanded to six lanes, making it easier for boaters to use. There are at least three areas where boat launch ramps and public access are major talking points. Newport Beach has a public boat launch ramp at Newport Dunes Waterfront Resort. While the ramp itself is functional and features plenty of parking there are some who have questioned the merits of its location. The city has struggled to find a feasible – and spacious – location to build a new public boat launch ramp somewhere along the harbor (and closer to the ocean). The city’s Harbor Commission acknowledged a shortage of public boat launch ramps in Newport Beach during a September 2015 meeting. Nearly 18 months has passed since the issue was discussed amongst commissioners and, to date, no solutions to address boat launch ramps and public access are in sight. Accessing the water via public boat launch ramp has been a sore – and controversial – subject in Redondo Beach. Boaters at King Harbor never had access to a public launch ramp since the waterfront venue became reality in the 1960s. City officials discussed plans to build a public boat launch at King Harbor for decades but with no success. Currently complicating matters was the recent passage of Measure C, which restricts redevelopment of the city’s King Harbor area. A harbor revitalization project known as The Waterfront included plans to build a boat launch ramp. However the plans are now in jeopardy after Redondo Beach voters overwhelming voted in favor of Measure C on March 7. 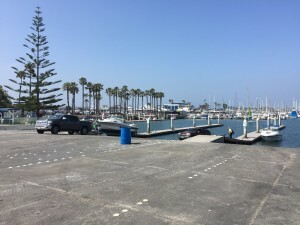 One of four moles in King Harbor – Mole B – was selected by city officials to be the designated public boat launch ramp for Redondo Beach boaters. Members of Rescue Our Waterfront (ROW), however, consistently argued Mole B is the worst location for a boat launch ramp, as the location is unsafe and actually limits public access to the water. ROW, the grassroots organization behind Measure C, has been urging the city to place a public boat launch ramp at Mole D.
Mole C would also be a viable option for boaters, according to ROW co-founder and City Council candidate Nils Nehrenheim. Nehrenheim added Moles C and D are easier to access from the street and provide boaters with more parking than Mole B. The California Coastal Commission could still weigh in on the ultimate fate of the boat launch ramp, as the state agency is expected to schedule a hearing soon to weigh in on Measure C and King Harbor’s revitalization plans. The Port of San Diego is on the verge of selecting a vendor to upgrade the Shelter Island Boat Launch Ramp. Port district staff announced the vendor bidding process for the boat launch ramp’s renovation project had closed in mid-March. A vendor could be awarded a contract as early as April 11. Once construction starts the Shelter Island Boat Launch Ramp – which is the only port-based boat launch ramp within San Diego city limits – will be shut down almost entirely until at least March 2018. The port district plans to improve public access to San Diego Bay by enlarging the boat launch ramp’s basin maneuvering area, replacing a worn-out ramp, increasing the length of boarding floats as well as installing signs, lighting and public walking platforms. The new boat launch ramp would also be up-to-date with Americans with Disabilities Act (ADA) standards. John Campbell, who organizes the area’s annual Yellowtail Derby, worried the design of the new public boat launch ramp would cause several avoidable problems. The entrance of the new boat launch ramp would be in the middle, instead of closer to eastside of the facility as currently designed. Wave currents and prevailing winds could possibly result in an increase of silt and water movement within the launch ramp basin, Campbell believed. Additional silt would result in the port district dredging the boat launch ramp facility area more often, according to Campbell. Another issue: limiting the boat launch ramp to one lane during construction would likely result in increased congestion, as local anglers and boaters use the facility all day and night. 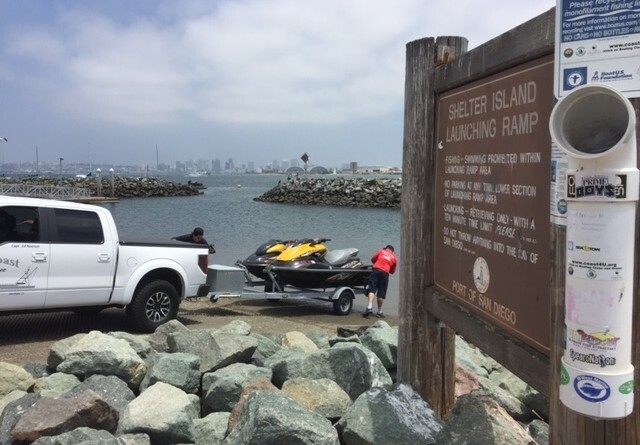 Other boat launch ramp locations on the San Diego metro area are found at National City’s Pepper Park, Mission Bay, Coronado’s Glorietta Bay, Oceanside and Chula Vista. The boat launch ramps immediately connected to San Diego Bay, though somewhat distant from Shelter Island, would possibly absorb some of the recreational vessel traffic deflected from the upper edge of the port during the construction period. Why is construction scheduled during the busiest use time of the year! Gone this long why not wait 3 months until Fall!!!! Gonna need traffic cops to handle the congestion if the fishing is great!